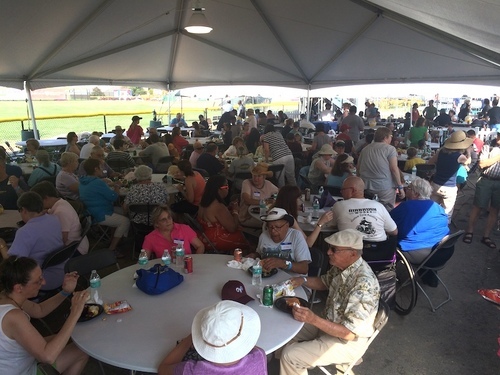 Bring your company, little league, or community organization to Hanover Insurance Park and enjoy a pre-game picnic under our left-field or center-field party tents. It's a fully-catered night at the ballpark for 20 or more of your friends and colleagues, and it's all-you-can-eat! Our menus range from Grilled Angus Burgers and Fitton Field Franks, Steak Sandwiches and Chicken Breast, to Steamed Lobster and Grilled Rib Eye Steak. Pick your menu and pick your favorite promotional night and we will take care of everything else. Your outing will begin 90 minutes before game time at Hanover Insurance Park (you'll be the first ones into the ball park to see our players and receive autographs). All guests receive a limited-edition Worcester Bravehearts navy & lime ball cap. There is a cash bar in our picnic area for alcohol purchase. In addition to your picnic, your group will be seated together in Box Seats for the game. Kids under 12 receive special pricing, and kids 2 and under are free! Picnic outings receive top priority for that night's contests, National Anthem, God Bless America, etc. Call (508) 438-3773 to organize your picnic outing today! Please note: To book a pre-game picnic, the outing must be arranged through a Bravehearts ticket representative in advance of the game.